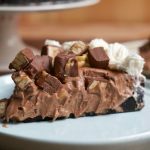 Hot Mess Nutella Snickers Pie + A Giveaway!! 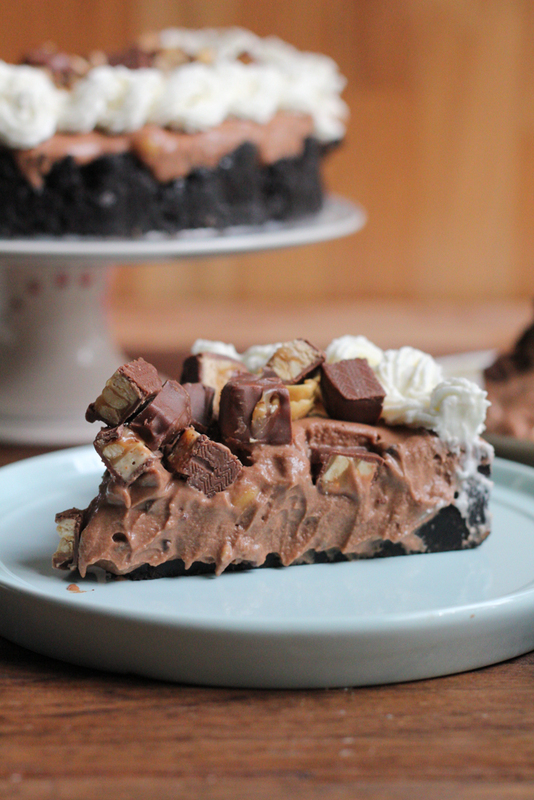 Hot Mess Nutella Snickers Pie!!! A creamy Nutella filling loaded with crushed peanuts and mini chocolate chips and topped with peanuts, whipped cream and bits of Snickers! This no bake pie is dessert heaven! From the cookbook, No-Bake Treats by Julianne Bayer. I’m home! To say I had a full week last week is an understatement. I’m not superstitious but I do believe when bad things happen, they happen in 3’s. Last week before I left for NYC, my husband Paul was driving home late and a deer came out of no where and hit the car. Paul stopped immediately and got out of the car and the deer got up and ran off. Thank you God it was ok. I’m praying the deer wasn’t hurt too badly. Makes me so sad. I’ve never even seen deers anywhere close to our house before. Then, the first day I was in NYC. . I spilled coffee all over my laptop. I always have to have coffee in the morning and I didn’t want to venture out in NYC at 6am to get coffee, so I ordered room service. The coffee comes in a carafe/pitcher/coffee pot type thing and I was going for my 3rd cup. . a little came out and so I – not thinking- tilted the entire thing over and of course, all the coffee came spilling out. All over my beloved laptop. I freaked. I immediately flipped the thing over and tried to get as much of the coffee as possible with a towel. Then, I left it open and face down for about 30 to 45 minutes and then tried to turn it on. It came on for like a second and then started flashing and then the screen went dead. And so did my heart. I keep an insane amount of information on my desktop. . I do back up stuff periodically to our icloud and server but don’t remember the last time I did that. Long story short, I found a place in NYC that was able to get all the data and stuff off my hard drive! So, the day was saved. Or, so I thought. That same day, while I was in an uber heading over to the Apple place to fix my laptop, I get a call from my kids’ elementary school. Madeline was hit by a swing during recess and knocked unconscious for 15 seconds. It was crazy you guys. You never want to get a call like that, especially when you are hundreds of miles away from your child and can’t get home fast enough. I call my mother to pick up Madeline, I call my husband to go home and take Madeline to the ER. First, it was she was hit in the head, then they think it was the back of her neck. No one really knows what happened. And no adult saw any of this happen. They got the story from a kid or kids watching. I’m going in this morning to say thank you to the staff and assistant principal who helped Madeline and my mother and was so kind and caring. Madeline is absolutely fine and was more shaken up by the whole ordeal. I am so thankful that she is ok.
And according to my counting skills, that’s three things. No more bad things can happen to me or my family! And because I love you guys, my readers, I’m here today with 3 great things for YOU! First up, this Snickers pie. This Snickers pie is so crazy delicious. . as a kid, Snickers were actually one of my favorite candy bars so this pie tastes extra delicious for me. This will cure any chocolate cravings and you Nutella lovers will flip over this! 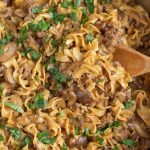 It does take some time to make and because it’s no-bake, you need to refrigerate it for 4 to 6 hours, or overnight. But it’s worth it you guys. It’s so worth it. 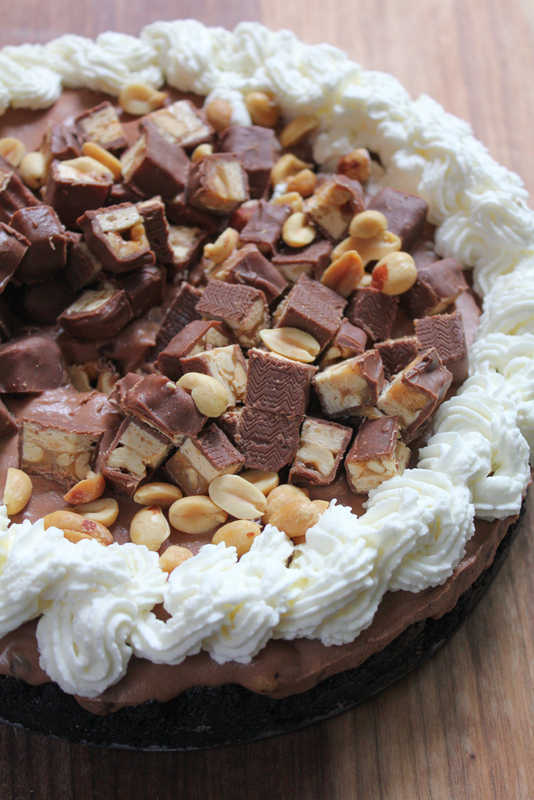 Just look at this Snickers pie. 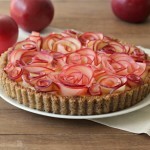 This pie is from my friend, Julianne‘s new cookbook, No-Bake Treats! And one of you lucky readers can win a copy of this book! Just leave a comment below saying why you want to win it! Good luck! Open to residents within the United States only. 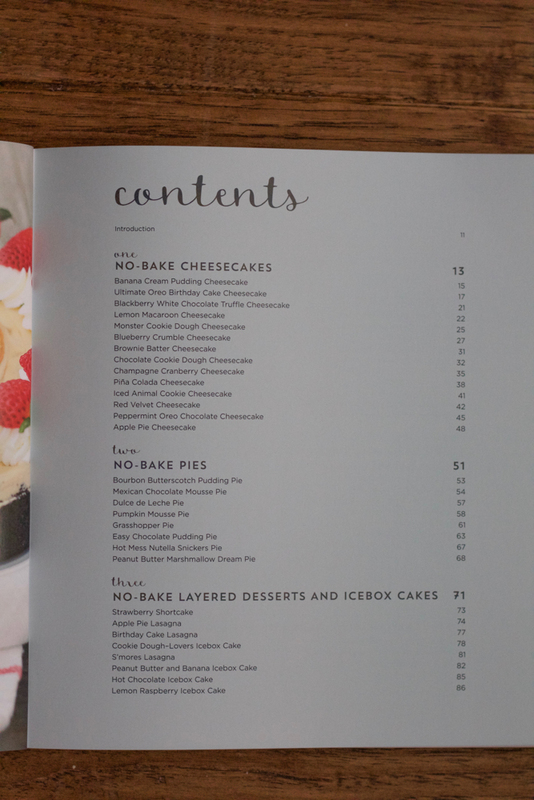 This cookbook is packed with cheesecakes, pies, layered desserts, icebox cakes, tarts, ice cream, frozen treats, cookies, bars and puddings and parfaits! And they are all no-bake! 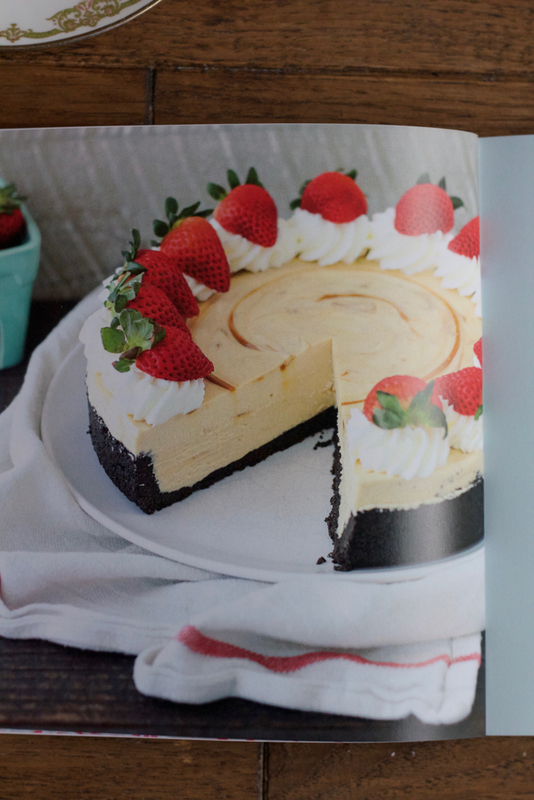 Every recipe in this cookbook has a beautiful photo so you know what the dessert looks like. 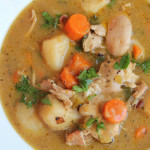 Some are time intensive and others are easy but all of the recipes are well written and easy to follow. 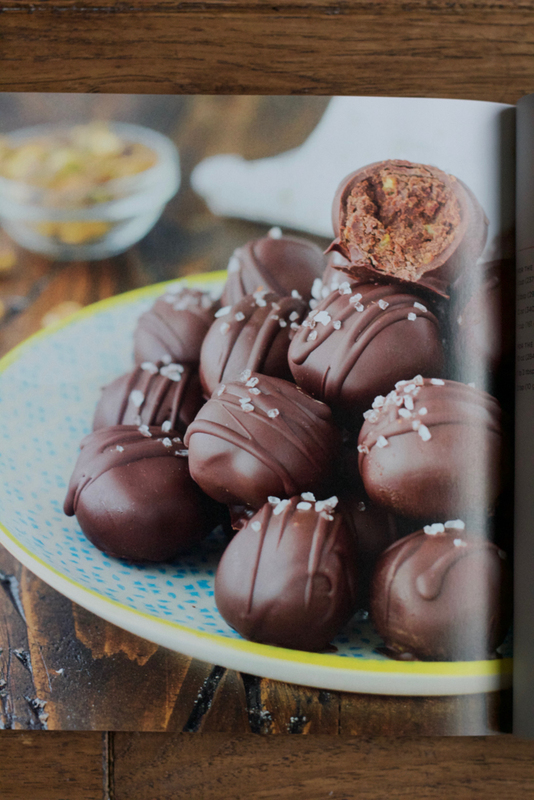 I’m so making these Salted Pistachio Dark Chocolate Truffles (page 167). Oh my! And this Dulce de Leche Pie (page 57). Holy wow! I’m convinced this is the only no-bake dessert cookbook you will ever need! Everything is in here. Congrats to you, Julianne, on this beautiful and delicious cookbook! Hooray! And this. Just watch it. To enter the giveaway, just leave a comment below saying why you want to win it! Good luck! Open to residents within the United States only. Giveaway runs for one week through Sunday, 10/9. Winner will be contacted on Monday, 10/10. 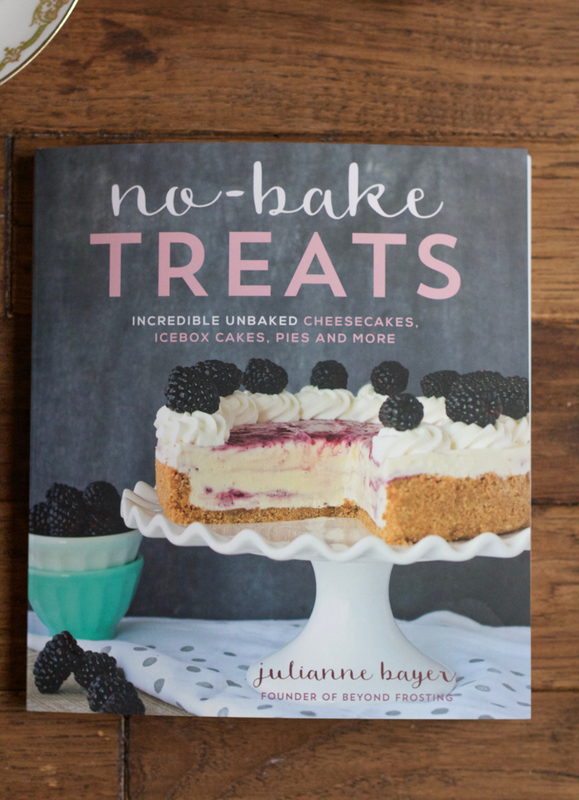 Excerpted from No Bake Treats: Incredible Unbaked Cheesecakes, Icebox Cakes, Pies and More by Julianne Bayer. Copyright © 2016. Reprinted with permission from Page Street Publishing Co.
Lattice Top Apple Pie #BakeForGood + A BIG @KingArthurFlour Giveaway! First of all, welcome home! Despite the scary occurrences, I’m glad that you’ve been having wonderful weeks overall – hope all stays well now! 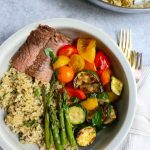 And here’s my giveaway comment = I want to win this cookbook because I’m trying to continue improving my baking skills – this cookbook would greatly enable me to do so. Thank you so much, Liz!!! Ugh sounds like you had quite a week, Alice! I’m so glad your daughter is ok! And I breathed a sigh of relief for you when your laptop was recovered. I’ve had mine crash before and it’s the WORST! So glad you made this pie for Monday. It looks SO good, especially because it has lots of Nutella! Wow! What a week you had! Let’s just hope that it’s all good from here, right? You must have been so scared when you heard about your daughter! Glad she is doing well!! OMG Alice! What a week! I believe in the same superstition, so things should be looking up! 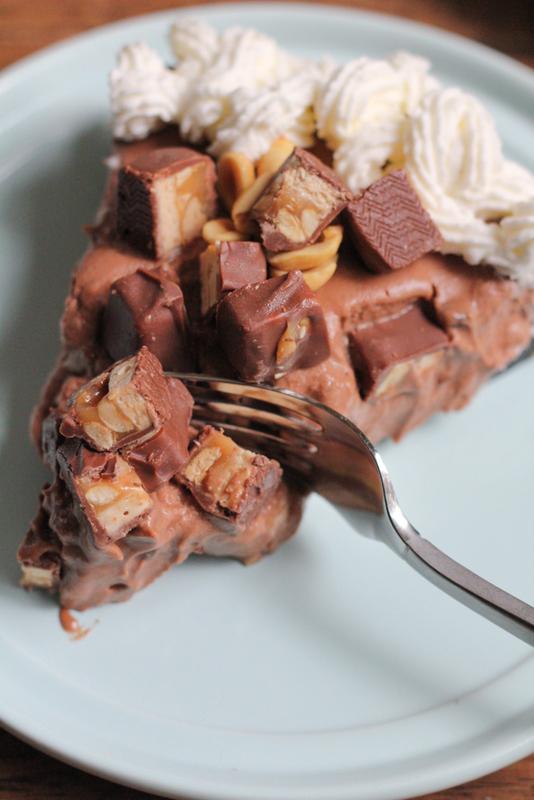 This Nutella snickers pie looks incredible! oh my! nutella + snickers? I want!! looks delicious! Looks like you had a crazy week Alice, yeah sometimes it’s just not our day! I am glad everything is okay now, take care. Oh my word Alice — that is so scray! I’m so glad she’s okay! I can just imagine what you were feeling 🙁 I’m so glad that things are looking up and this pie looks AMAZING! Love Julianne’s book! Most of all, I’m glad your daughter is ok! What a week Alice! Here’s to an awesome week and this hot mess will help for sure! That is so terrifying as a parent to get that call! I’m so glad she’s okay. I don’t think this looks like a mess at all – it looks amazing. Any kind of dessert with Nutella AND Snickers in is good with me. What a crazy series of events! Sending luck your way. I would love to win this book. I love nutella and snickers, but.no bake treats are right up my alley lately being pregnant and not wanting to do as much intense baking, but still craving allllll the sweets! Yikes you had quiet a week. My weekend consisted of a blow out on our car leaving us having to walk 5 miles to the next town to see if we can use a phone for one of our family members to help us our phones happened to die on us we were out of town getting lady minute wedding items. Our day was the worst glad all is okay with your daughter. My comments for the give away would be—> I’m getting married November the 5th I love baking and trying new things this would be awesome to have for me to bake something different for my husband to be and in laws! Especially since my schedule is always busy I can make pop in the freezer and go. Thank you. I love to bake and am home on maternity leave with a 6 week old.. Between trying to get him to nap and eat and take care of myself I have been trying to get in the kitchen some more but time is never on my side! This cookbook would help immensely with not having to bake the sweet treats I crave!! 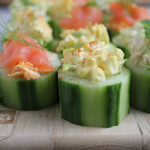 Glad I stumbled across your blog as I will be checking back for more great recipes! The mess Nutella pie looks like a must make!! Welcome back! Hopefully no more scary occurrences so you and your family can enjoy that wonderful pie! I want to win this cookbook because I’m trying to explore baking without the use of an oven since I have little ones to watch out for and would love to include them when I bake! This cookbook would be extremely helpful! My husband was driving my car and hit a deer last week also. It was so scary! The car is in the shop right now. Anyway, I would love to win this book and try some of these recipes! Oh my gosh, I don’t even know where to start. I’m so glad Madeline is ok! I can’t believe you had to deal with that while you were out of town, how terrifying. But the pie looks like a perfect way to soothe the soul. Thanks so much, Jen!! yeah, I was a wreck when I got the phone call. . but thankful my mother and husband were there with her shortly after she got hit. I have a serious sweet tooth and love a variety of desserts. I like the idea of no bake treats, especially during the summer months when its too hot to run the oven! The pie recipe looks divine. So glad I found you on IG and now your blog. 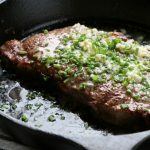 I print out pretty much all your recipes. 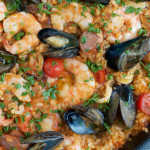 Your recipes are a great balance between healthy and real. I have hungry teens drop by our house for snacks all the time. Being able to make no bake treats to have available would be great! Thank you so much, Leann!!!! Your comment just made my day! Means a lot, thank you! 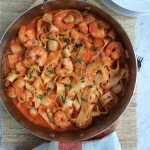 Can’t wait to give this a try, Alice – it looks like a hot mess of deliciousness! Oh man. I’m glad everybody is okay except your beloved laptop, but what a crazy week. I’m sorry about the coffee, really. I’ve done stuff like that. We all have! This pie looks incredible. I have that drool-worthy cookbook, and can’t wait to make everything in it! Thank you so much, Mir!!! I’m happy to hear that in the end, everyone was ok!! This book looks amazing! I would love to have some recipes that don’t require baking. I also love that all of the recipes have pictures! 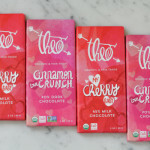 I can’t wait to test these desserts out! I love to cook but we have limited time at our house so the idea of no-bake desserts is appealing to me! 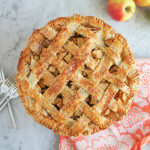 Now this is one fine looking pie! 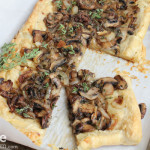 Omg this looks divine! I’d love to win because we all need some no-bake help on crazy days. Glad to hear everyone is okay! I’d love to try some of the recipes in this cookbook! I want to win it bc it looks great! My sister could make some killer things from this (and she looooves her cookbooks)! What a crazy week you had! Glad to hear everyone is ok. 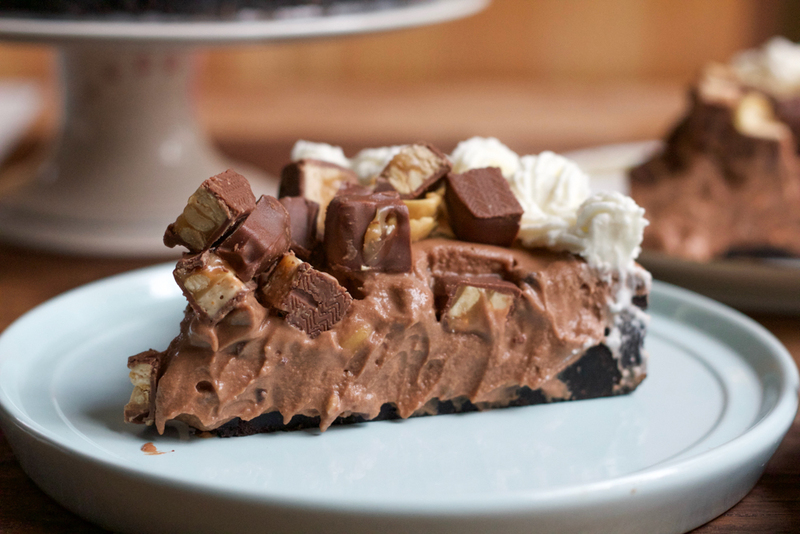 This snickers pie looks to die for! 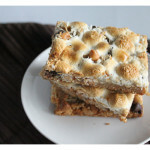 I want to win this giveaway to improve my baking skills! Oh my! I need this in my life now!